Progress and innovation in technology were of exceptional importance for the development of ancient societies and have been of great interest to many disciplines. 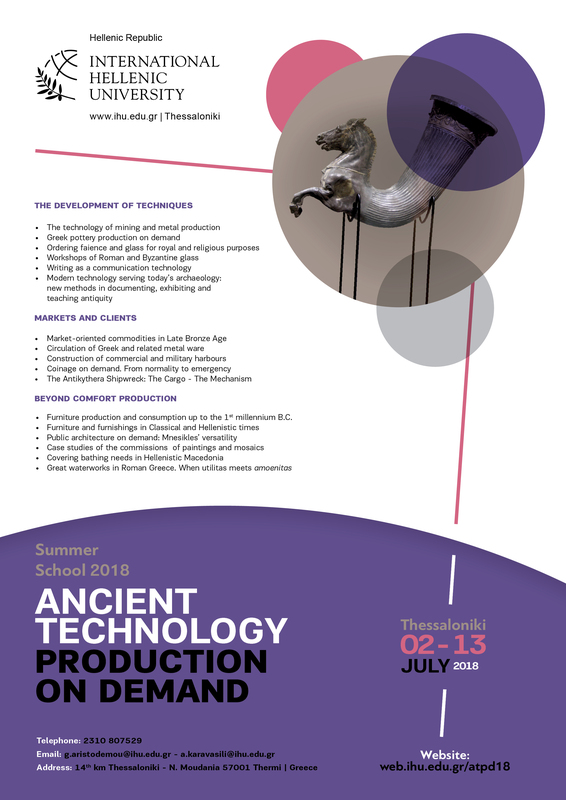 This year, the Ancient Technology Summer School discusses Production on Demand issues, offering the opportunity to examine how technological achievements of ancient cultures meet the needs of individuals or the wider society. Subjects such as how the diffusion of improved infrastructural, organizational and mechanical technologies facilitated the production and distribution of everyday or luxury items (e.g. faience, glassware, furniture, ceramics, toreutics, etc) or how the invention and transfer of new technologies served the needs of the ancient communities for comfort and well-being will be discussed. In the course of the programme, the latest archaeological and historical research along with state-of-the-art scientific techniques applied to the study of antiquities will be presented by senior academics and field archaeologists who are experts in their research areas. 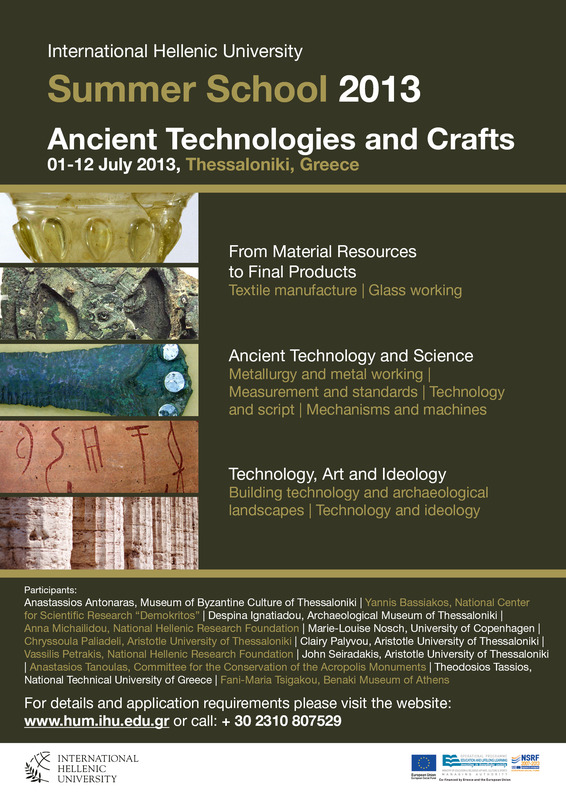 The Summer School on Ancient Technology is planned to be held annually with the aim of a) providing an international forum on technological achievements of the ancient Greek world and b) making greater use of the rich resources of Greece in terms of specialists in ancient technology research. The aim of this 2-week intensive School is to make the participants more acquainted with aspects of ancient technologies by providing up-to-date knowledge presented and discussed by the experts of the relevant fields. For 2018, the series of lectures offered are focusing on Ancient Technology & Production on Demand. The series of lectures deploy around three interconnected topics. Modern technology serving today’s archaeology: new methods in documenting, exhibiting and teaching antiquity. 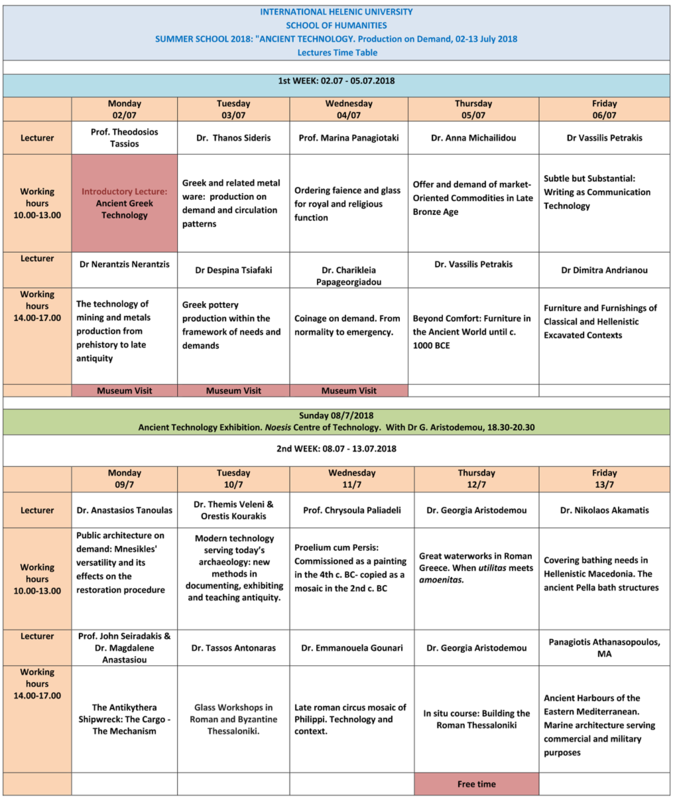 For the period of 2 weeks (Monday to Friday) 20 lectures will be offered (10.00-12.30 hrs & 14.00-16.30 hrs). Total duration 55 hours, plus hours for Museum and Site Visits. All lectures will be in English and will be held at the International Hellenic University, Thessaloniki, Greece. A Certificate of Attendance will be provided at the end of the programme to all participants who have fulfilled the course requirements. Dr Anna Michailidou, Research Director Emerita, Research Centre for Greek and Roman Antiquity, Institute of Historical Research, The National Hellenic Research Foundation. The tuition fees are 350€. Participants will have to cover their own travel, accommodation and everyday expenses. Total fees of 250€ for those participating at the Technology Workshop (7-9 May, 2018)! The Summer School on Ancient Technology. Production on Demand welcomes applicants from a wide range of educational backgrounds. Participants can be undergraduate students and graduates of related disciplines (Archaeology, Architecture, Museology, Conservation Studies, History, Tourism, Political Science, etc.). Applications from other professionals with an interest in archaeology and ancient technology will also be taken into consideration. Applicants should be well acquainted with the English language. All applicants will be notified of admission decisions by e-mail in the next 10 working days upon receiving their application. The course is open to a maximum of 35 participants whilst IHU reserves the right to postpone the Summer Course for the next year, in case a minimum enrollment is not achieved by 31th May 2018.